“Be sure and wipe your paws!” I find myself thinking this after I clean the home. If there was one thing I wish my sweet puppies could do on their own, it would be that. But, they can’t. They lack opposable thumbs and the ability to focus on one thing besides a ball for more than 30 seconds. But, not only do we wish for clean paws, we wish for a clean home while enjoying our furry kiddos. Well, today, I’d love to talk about that. If you want to keep your house clean, you must start with keeping your pets clean. I bathe my dogs regularly. Different breeds have different bathing requirement, so check with your groomer or vet for guidelines. Also, why is it that my dogs loathe getting bathed but they will jump right in if they see a swimming pool? Now that we have clean puppies, they also need a puppy manicure. 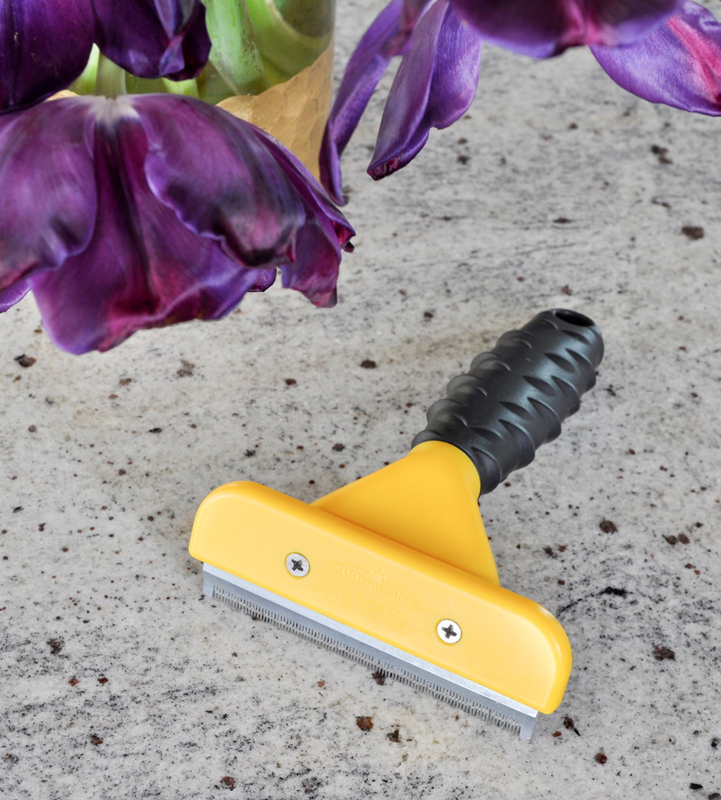 This is something that your wood floors and fabrics will thank you for doing. I’ll be honest, I have clippers that I use, but I’m most comfortable having this done by our groomer or veterinarian. It’s nice to have clippers on hand though. As most of us enjoy having our hair brushed, the same could be said for our furry children. If you brush them regularly, their coats will not only look much healthier, but they will shed less. To maximize this effort, I recommend using the FURminator product line. It is my secret weapon, best purchase ever, life altering. Seriously. After this process, I sweep and vacuum. Then I vacuum some more. I use a Shark and I typically vacuum three to five times per week. It just depends upon what we have scheduled. For a quick clean and dusting, I sweep the wood floors with a static broom which keeps the hair all together until I am finished. Now, no matter how hard you try, every once in a while your pets may have an accident. They feel terrible when it happens. It’s often the owner’s fault for not letting them outside, or perhaps they may not feel well. With this inevitability in mind, I always look into stain resistant fabrics. The chaise lounge, living room chairs, and the small couch at the end of our bed are adorned with stain resistant fabrics. I also have a rug that I can clean. I have a small steam cleaner which works very well for pet stains. These decisions have already paid dividends on multiple occasions. All of our pets like to lay claim to a certain spot. This behavior is normal and they absolutely love their pet beds. Each night they make a beeline to their own “spot” which is typically a bed or soft blanket or two. I wash the dog blankets and bed covers about once a week, and never less than twice per month. 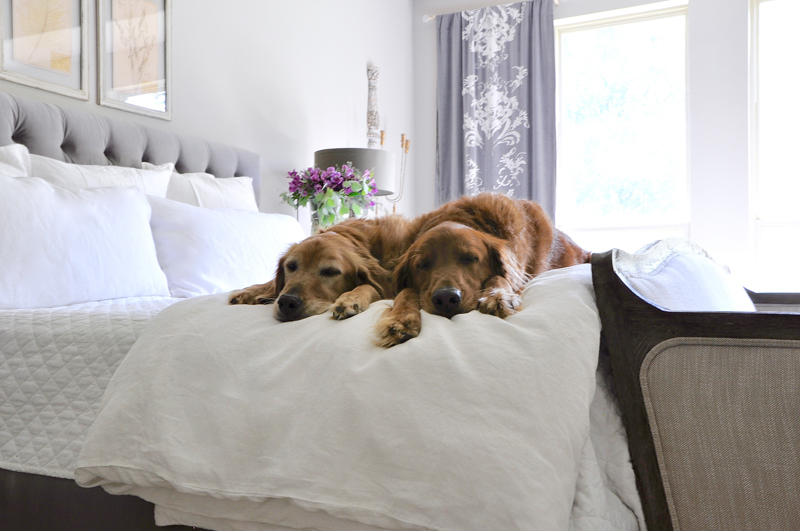 When it comes to our bedding, my fabric of choice is linen. It is washable, breathable and simply elegant. I don’t let the dogs on the bed when it’s made up, but on the rare occasion that they end up on it without permission (you may have seen a few of these incidents on Instagram or here on my blog), all of our bedding can be washed. 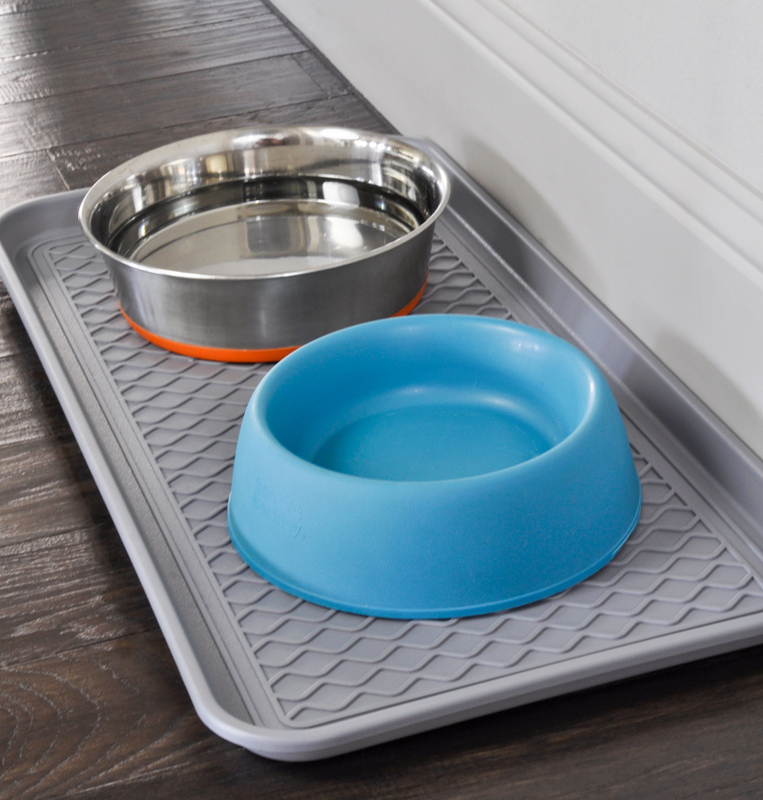 One great tip is to keep their food and water bowls on a mat in a location that is a little out of the way from your higher traffic areas. Also, I always pick up food bowls after meals. 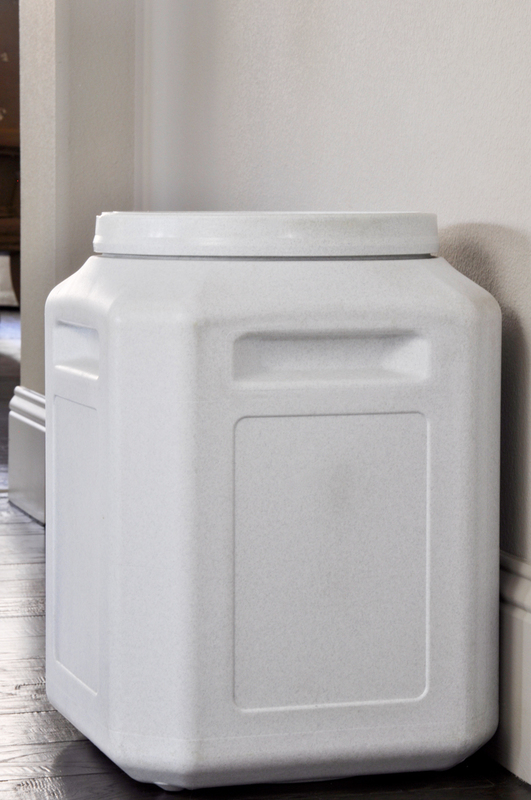 The dog food is stored in a storage container with a lid which is far more tidy than the bag. Side note…..I order my dog food from Amazon and it arrives on my doorstep, which is a huge time saver. When it comes to play time, all of our dogs have a favorite toy. All of these (I would imagine we have 30 or so) are housed in a decorative basket specifically for their toys. I frequently wash the toys so they don’t have an odor. Did I mention that we wipe their paws? Every paw. Every time. I keep towels and a small throw rug next to the back door. I also use pet wipes. It’s so cute now as they know and expect to have them wiped. Every once in a while, a couple of them will raise their paw for me. 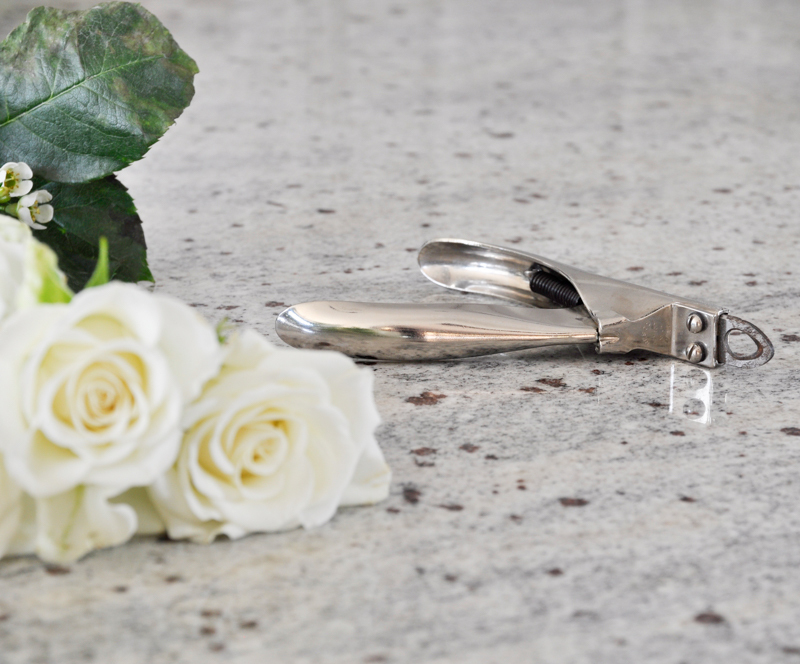 Below, you will find the products I use regularly in my home. To make all of this easier, I try to focus on forming the right habits for them, such as the paw wiping I just referenced. They know where to eat treats. They know where their toys are stored. Most importantly, they know they are loved. And they’re family. They love to please you and there is nothing like that sweet pet nap as they lean into you. Hopefully this helped you strategize with respect to your own pets. 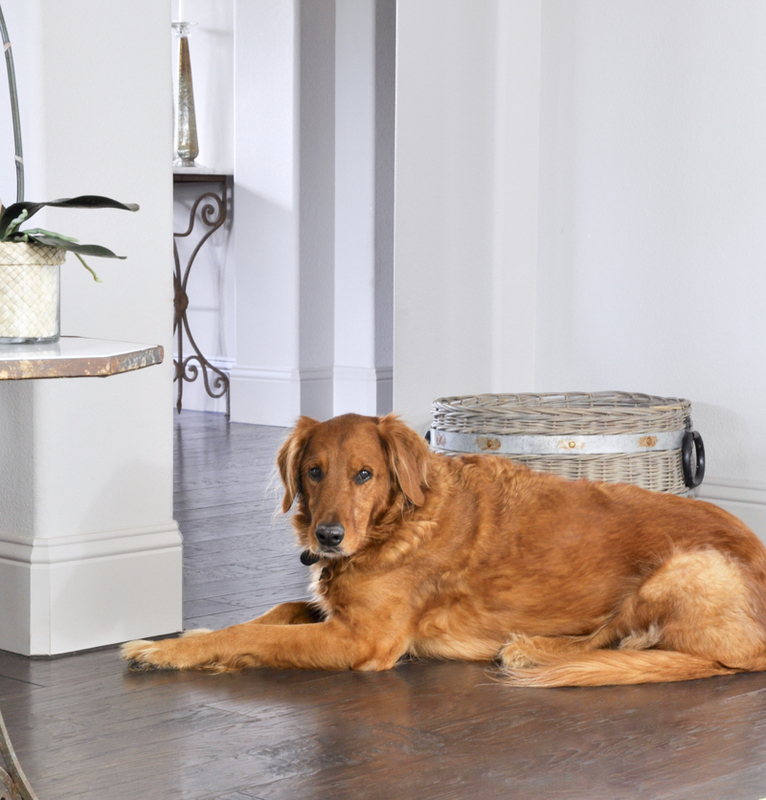 With a little planning and time dedication, you can keep your home looking fantastic…even if you have four dogs! I love seeing your golden retrievers Jen! 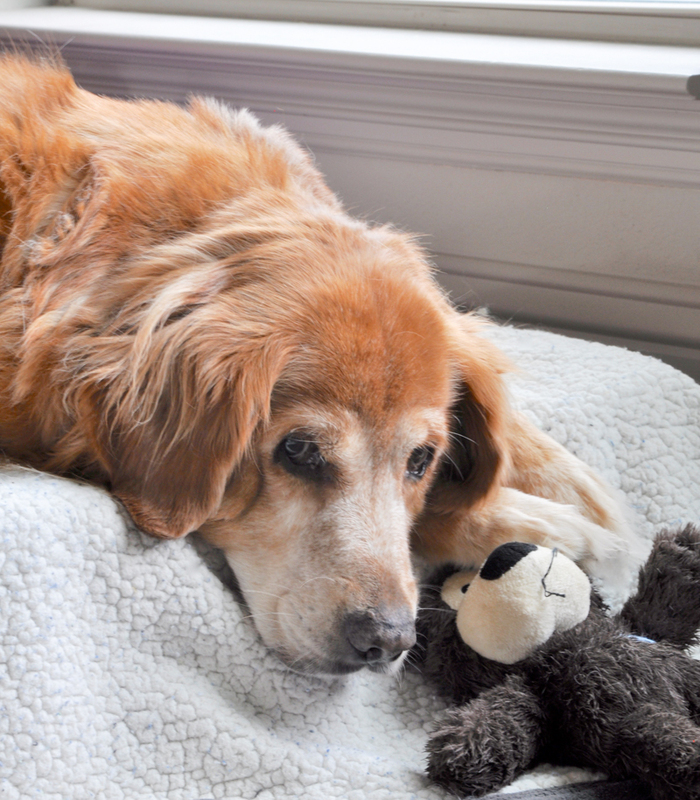 We had one named, Abby, for 11 years and she was the sweetest dog! I’m also glad to see that even your pups are on the furniture. Dak is breaking all the furniture rules around here but he’s too cuddly to keep off. We just keep throw blankets on hand for him. Great post idea! Lol…Dax is going to keep you on your toes for sure! We do the throw blanket thing too…I may have to add that! I remember you telling me about Abby. I know you loved her very much. We had a Golden named Abby too. She was an angel. Great tips, Jennifer. 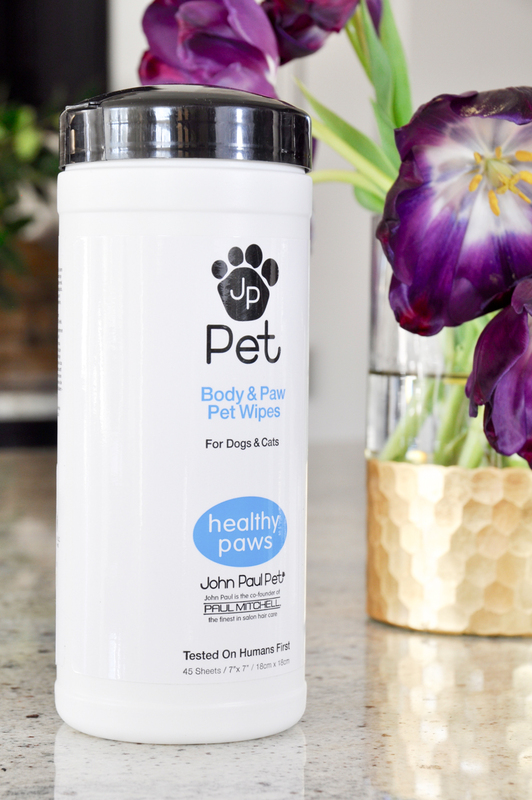 We also wipe our dogs’ paws, all 16! My sweet Victor (playing now in heaven), knew which paw to lift by the number we called them. Such a smart sweet boy & sorely missed. We are also lucky to be able to let them in the door off our bedroom and have them spend a little time in the mud room area to let the twigs and bits of mulch fall off before allowing them in the main living areas. Poodle & schnauzer hair picks up all kinds of debris. 16 paws is such a great number!I know you loved sweet Victor so much. Our Riley lifts each foot for cleaning too. it’s so cute! And yes, you are so lucky to have an extra door and a mudroom area….I could certainly use both! Did you say you had 4 dogs??? 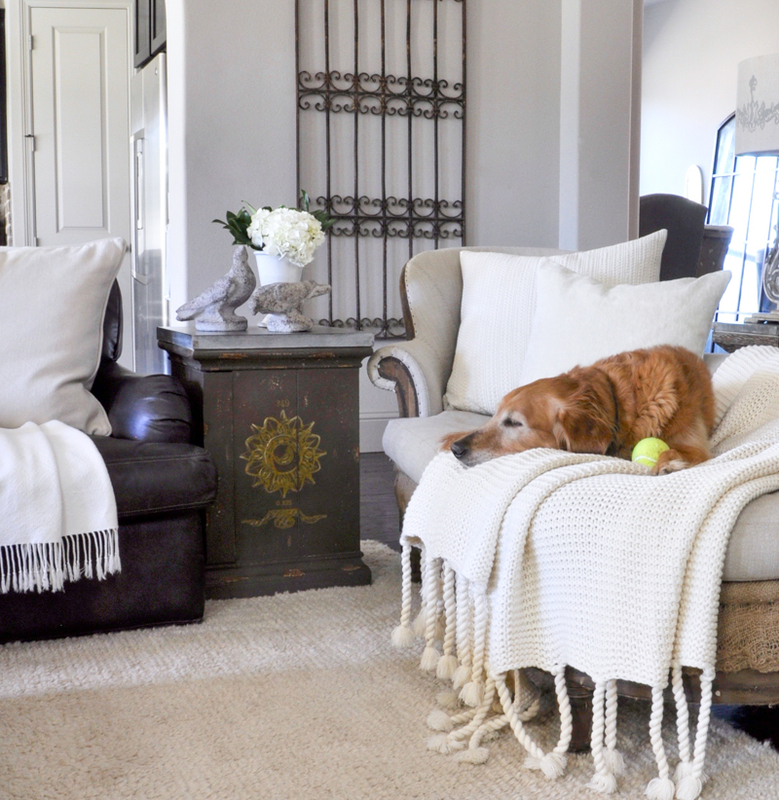 Maybe I misunderstood…but even with 2 dogs your house is impeccably clean and gorgeous! I have 3 cats and a dog and lots of throw blankets too! I liked seeing the Paul Mitchell wipes. Never saw those before. I’ll have to get some! Enjoyed the article! Yes! We have four! We also have two cats. I use throw blankets (some made for pets and some regular ones) everywhere! It takes hours to wash them, but the sweet pets are worth it! As far as the wipes, I love them. I can’t remember how I first found them, but they are by far my favorites. Hope you like them too! We are Golden Retriever lovers too!!! We have a fur baby named Murphy and he is just as sweet as can be. Thank you for this post! 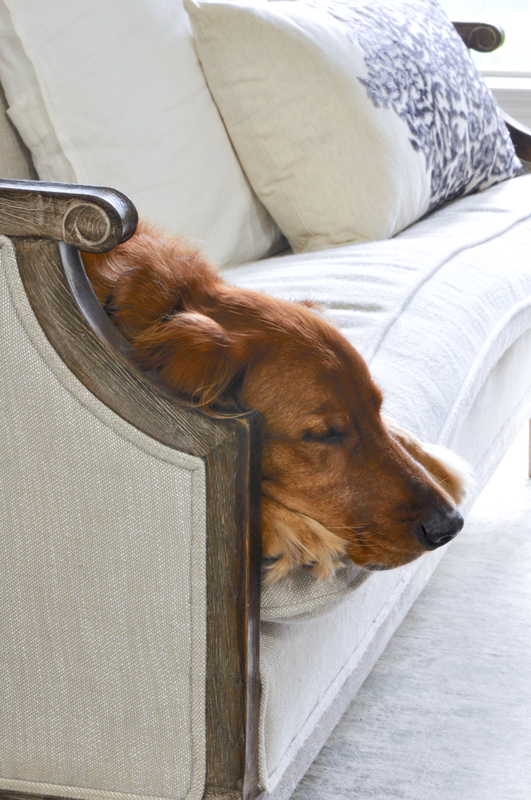 It is tough keeping the house clean with a Golden but definitely doable. We do many of the things that you mentioned in this post, except we do allow him to sleep on our bed. 😉 We tried keeping him off on his own puppy bed but he loves to cuddle so much that he was constantly asking to come up during the night. So, we eventually caved! Aren’t goldens the sweetest? I loved reading about your boy, Murphy! We’ve had at least one golden for 20 years now and I can’t imagine life without these loving creatures! We do let our dogs sleep with us too, I just don’t let them on the bedding when the bed is made up. Hope that is more clear! Awww so sweet! Great tips, Jen! I put socks on our dogs paws when it’s wet outside in the mornings and the grass is wet. It keeps all the wet grass from sticking to his fur. And he has learned to raise his paws for me to put his socks on every morning. Such a good baby. That is a great idea! Your baby does sound like such a good boy. I have one who lifts his feet to be cleaned. So sweet! Such wonderful tips! 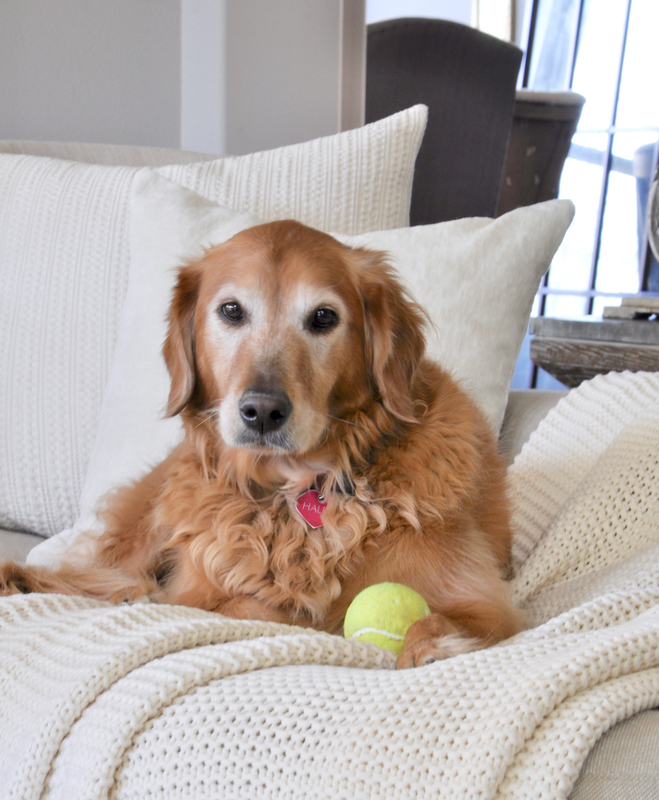 Can you show us how you incorporate their pet beds into your decor? They are so bulky and awkward, I don’t want it throwing off my whole bedroom theme! Great idea for a post. I do a few different things and I’ll try to write about them soon. One easy tip that I’m sure you know is to try to use bed that are either the color of your floors so they blend in OR the color of your decor. Hope this helps! Your home is beautiful! I can’t believe you have 4 dogs and it still looks so clean! Do you have any tips for how to keep them from rubbing their bodies on the couches or furniture? My dog loves to rub against my couch and it is light colored so over time it has started to look dirtier- eeek! Thank you so much Karly! We haven’t had that issue. This may not be enough of a deterrent, but if you can’t train them to stop, would a well placed throw or sofa table prevent it? I wish I had a better option!